I have a thing about setting trays. Maybe it's because I tend to collect tole trays and individual dishes when I see them, at thrift stores and rummage sales. Maybe it's because we don't entertain very often. It's a chance for me to "play" with my dishes... a creative outlet, if you will. The blue transferware dish belonged to my mother. It's a little chipped and worn, but I love the scene on it, and as it's the only one I have, I like to use it occasionally for a single setting like a tray. I used a Waterford water goblet for my orange juice. My husband's family and my mother gave us a few pieces for Christmas and birthdays for the first few years after we were married. It's lovely to use them and think of all those happy celebrations years ago. I love monogrammed silver. This tiny piece was given to me by my dear friend Robin. It fits perfectly in my Waterford jam jar. Here is the jam jar, a gift from my mother. Do you use pretty pieces every day? I often think I should not save these things for a special occasion. 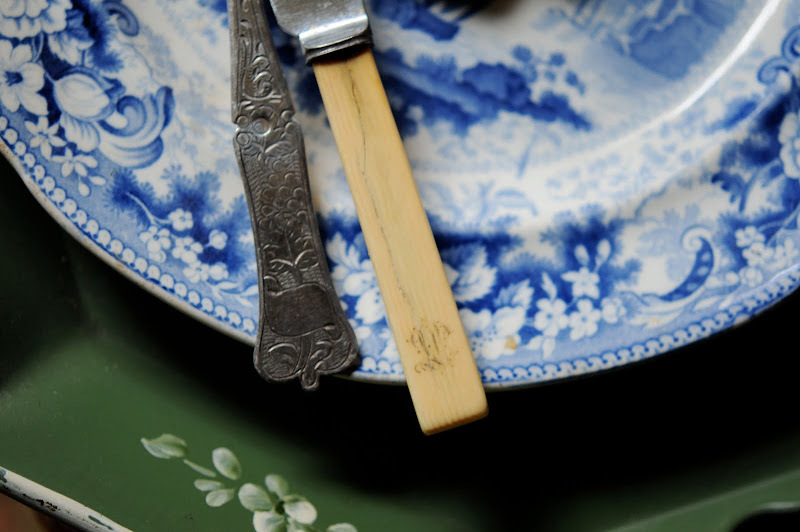 How much more gracious would life be if we dined on Spode and Waterford every day?! The flowers are white azaleas, from shrubs that grow in our yard. The bud vase was a gift from a very sweet blogging friend, Sue of Rabbit Run Cottage. I'm linking (late!) this little "trayscape" to Susan's Tablescape Thursday. Thank you so much, Susan, for being such a wonderful hostess! I am also linking to Cindy's Show & Tell Friday. Thanks for having this wonderful party, Cindy! It's all so beautiful! I firmly believe life is too short to not enjoy all the beautiful things we have and it makes the day so much brighter to treat yourself with special things. All your collections are gorgeous and I love looking at how you artfully arrange everything ~ Enjoy your day! Just lovely. I try to use my lovely china and silver at least once a week. Or I set up a vignette with them and just look at it so I don't have to deal with hand washing. Very pretty and lovely photographs as usual. I love the idea of using your best pieces for everyday use. Your things are too pretty to be "on display" only. 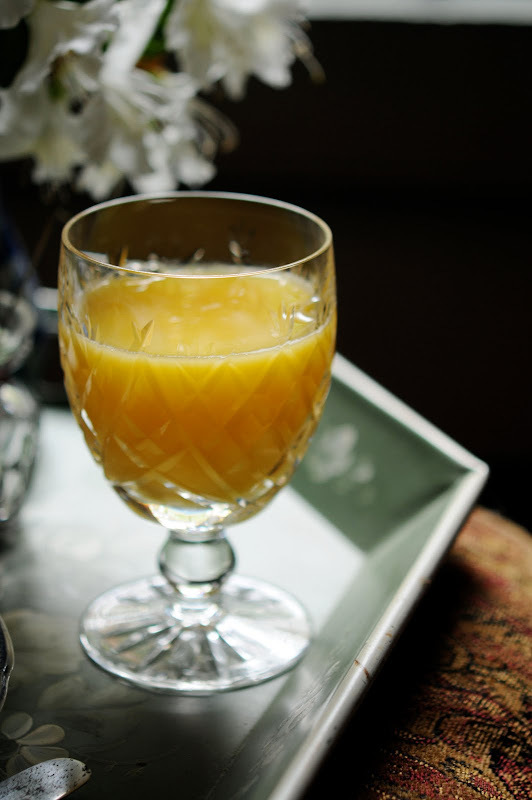 Orange juice tastes sweeter in a crystal goblet. Love your blog. It is all so pretty, and it's such a wonderful "habit" to enjoy a pretty setting for yourself or with your family. I've always had the attitude that why have it if you aren't going to use it! Your photography is just beautiful! Beautiful blue and white tablescape. 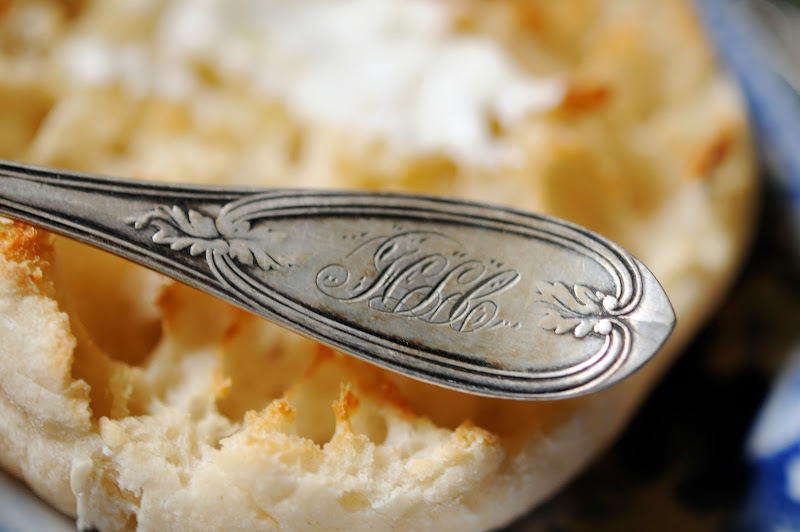 Love the pretty jelly jar and the old silver and bone handle flatware. beautiful setting - i love english muffins and blackberry jam. I'm really regretting the McMuffin I ate out of a paperbag this morning. You are right. We should take the time to be good to ourselves and use the good "stuff"! How beautiful... and I agree with you. Its nice to use some of these things on an ordinary day. I have some monogrammed silver and china from my family. I hope my kids will treasure tHem as much as I do!! By the way, you take lovely pictures. What a beautiful tray! I love to use my nice things for 'everyday' because it's fun and I think it's a shame to only use them on rare occasions. I love your jam jar and pretty silver monogrammed spoon! I love vintage silver. Very pretty and great pictures! Me, too...I LOVE using my trays. Your breakfast tray is lovely...great photos.. So pretty! It's wonderful that you use pieces that mean so much to you -- even though you will have to wash them by hand. I just reread an '08 Victoria magazine (May/June) article about using our good china every day, or at least often, instead of only displaying these beautiful dishes "in case they break". Good advice, and I am happy to see you enjoying yours, Mary! Very pretty piece you used. Love that they are not perfect but still beautiful. What a beautiful breakfast! The little red house is a magical spot! This is just so lovely, classy and fresh at the same time. I love your style mary, always have. I am so happy the little vase has such a happy home surrounded by your treasures. Fabulous transferware! I love it!!! Fabulous photos. And I adore the white rhododendron/azalea. Very nice an yummy impressions of a cute tablescape. We all need a treat, so breakfast with crystal and silver is fine with me. I hope you have a wonderful weekend. 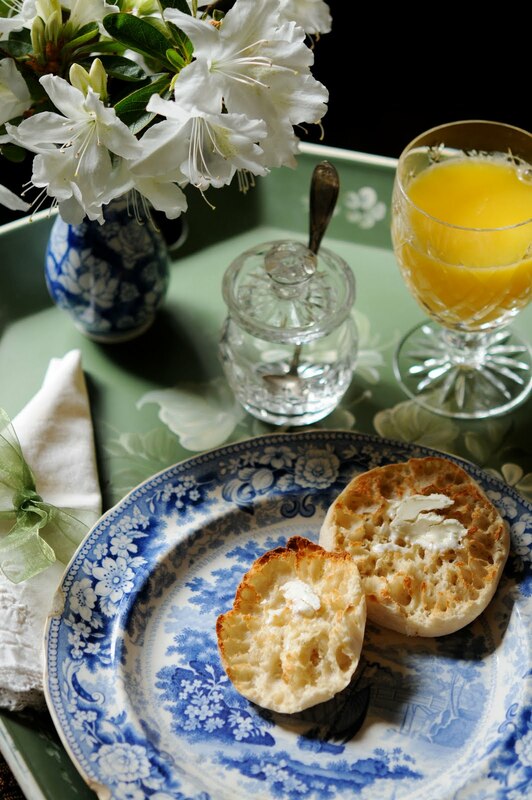 What a lovely breakfast tray...love that blue and white plate. Yes, I use all of my dishes, silver, crystal...my motto is if you don't use it, get rid of it. So lovely! 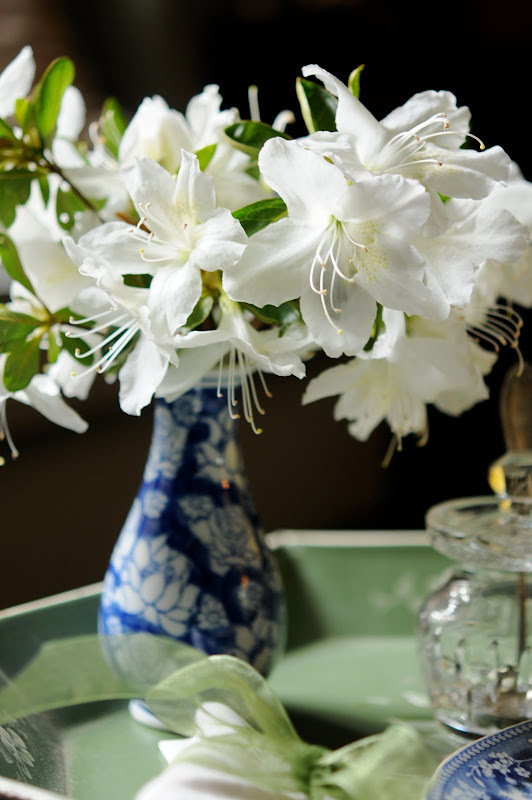 The white azaleas look perfect on your tray, and I love that you're using your treasures for a simple breakfast. Orange juice just tastes better in a pretty goblet! I love reading your posts, Mary. You always remind me to stop and smell the flowers. I eat on the run, on my way to work and do weekend breakfasts with a more upscale twist. Love it! I have no Waterford. Nor do I have Spode. So I'm living the gracious life vicariously through you. I do hope you don't mind. Hi Mary, your breakfast it´s so elegance! I use my pieces everyday too. A touch of glamour in the day make me happy! Hi Mary; What a lovely way to start the morning. your breakfast tray is very beautiful, and yummy looking.... I think I just might be treating my self tomorrow morning to a breakfast tray. A lovely breakfast tray! I'm in favor of using the "good stuff" as often as possible. When I was growing up we used the "good" silver everyday - it's all we had! But my husband's family never used any of it - even for holidays. 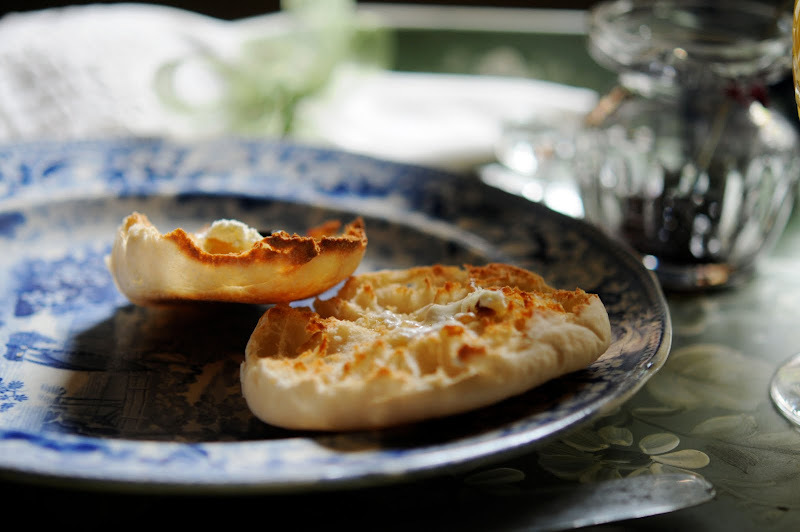 What a lovely way to enjoy an English muffin! I like to set a single try as well. In fact, many nights I'll set individual trays for my husband and myself. It's a cozy way to dine! Love your tray with all the beautiful pieces. 31 years ago when I got married we received a tray similar to the one you have in this picture. Is it metal and green by chance? I don't have it anymore and could just kick myself for getting rid of it. Can you tell me about it? I actually used it to hang on the wall! LOL Didn't know what to do with it back then! But I'd sure use it now just the way you show it! Thanks, everyone, for your kind comments! What a gorgeous setting! Beautiful photos too! LOVE the plate...I use all mine that are chipped. 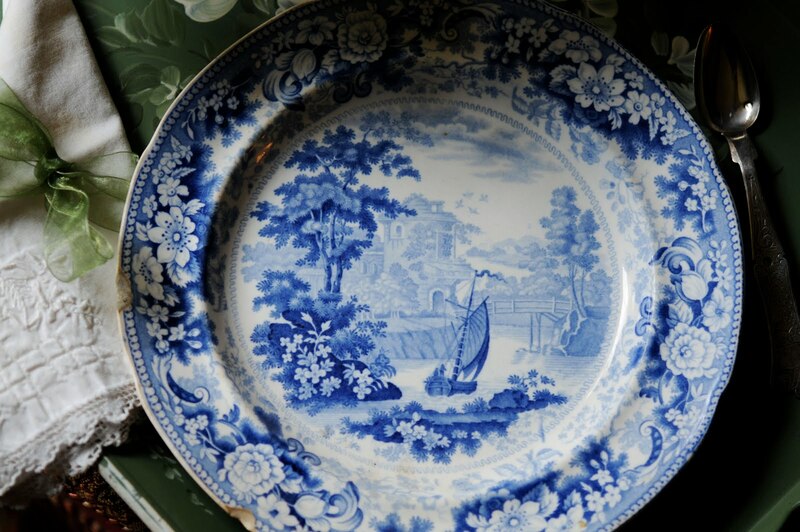 Funny, last night my parents were over and I pulled out some vintage chipped Blue Willow bowls of my great grandmother's to serve them and we all laughed because we still had the 110-piece set of Noritake stting everywhere but I reached for the chipped dishes. Love your silver too! I also love monogrammed pieces and most of mine sterling has different monograms, but I love it that way. Anyway, your tray is just beautiful!! Very pretty, and so elegant. Your pictures are really wonderful. I love using my "good stuff" everyday. Not that I have any waterford, but still, I do try to make each meal, and all the everyday rituals, special in their own way by using the nice things that I have. I'd love for you to drop by sometime. I'm having a giveaway you might be interested in. great setting even for one.. love your photos.. captured the beauty of those plate, goblets and muffins.. scrumptious! What fun! 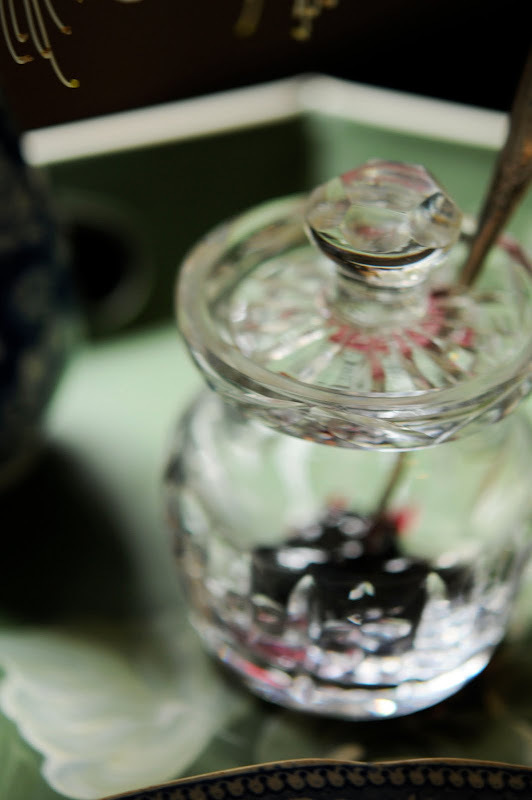 It gives me a new idea for practicing photography, AND appreciating the few nice little things we have tucked in our china cabinets. Beautiful pics, Mary. You are so disciplined..I would have to have a little Trader Joe's blueberry preserves on that muffin! I do put my Waterford in the dishwasher. It is so much thicker than my wedding crystal..Nothing has happened to it...It probably goes in about 5 times a year..
Mary I love monogrammed silver also! Love this post, Mary. I love seeing your things, Mary, and you've gone over the top this time! You've inspired me to set my breakfast on some of my trays and use my pretty things for ME! Just this morning I was wondering what I could do to make my poor, pitiful low-fat, low-sodium, low-sugar breakfast seem more appetizing and appealing. You've hit on it - this is the answer! The setting will make it so special that I will forget that it's not the 'old' breakfast I love. Last year I heard a professional organizer who spoke to a large group of women where I was present. Her subject was about making our homes and lives more special than just the ordinary. 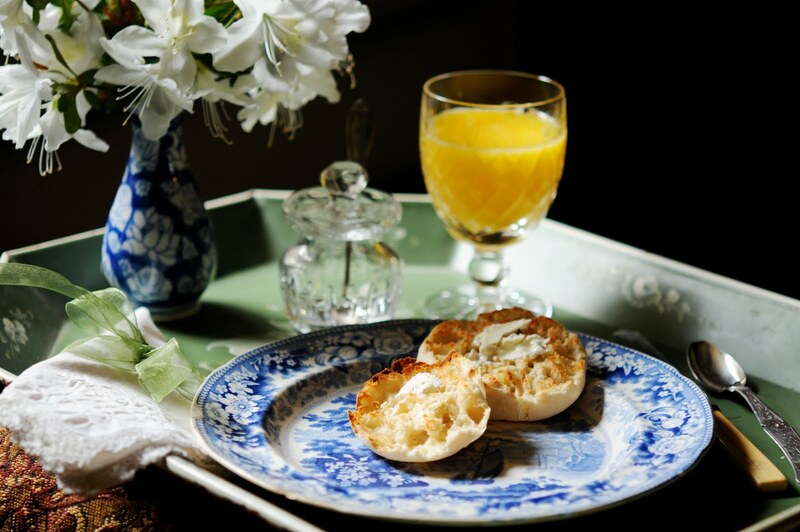 She said every morning she sits down to her breakfast - after her husband and family are gone - complete with silver, linen napkin, nice china, pretty placemat, flowers and a candle that is lit. You've reminded me that it's my turn to take such care of my breakfasts. Thank you for sharing this and for inspiring me. now that's the way we should enjoy breakfast every morning. what beautiful settings. oj just couldn't taste any better right! 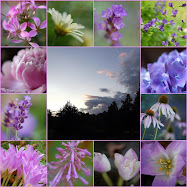 Your photos are so beautiful Mary!!! I thought I recognized that tray! I'm so happy it has a nice home!! !